The conflict between Israel and Hamas continues to distract from the Israeli land grab in the West Bank, which has accelerated under Israeli Prime Minister Benjamin Netanyahu and his Foreign Minister and now electoral list partner Avigdor Lieberman, who says Palestinians should settle for just 40% of it, along with Gaza (which is almost water-less), while Israel keeps the entire former British Mandate of Palestine along with 60% of the West Bank (1). As soon as the Gaza crisis became the media focus Netanyahu’s Finance Minister Yuval Stenitz told Israeli journalists “we doubled the budgets [allocated] to Judea and Samaria. We did it with a low profile” so that “elements in Israel and abroad” wouldn’t block it (6). Netanyahu’s government has gone beyond even previous Israeli government’s annexation of West Bank land by formally authorising Israeli settlements even East of the vast Israeli “barrier wall”. These new settlements are not only illegal under international law (as all Israeli settlements in the West Bank are) but even under Israeli law according to Israeli Supreme Court rulings (7). 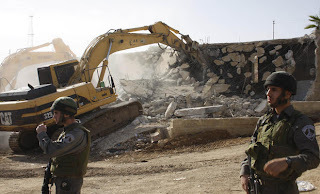 Israeli Defence Minister Ehud Barak (who was also Defence minister in the previous government during the previous Gaza war in December 2008 to January 2009) personally approved the five-fold expansion of one West Bank settlement in September (8). A freedom of information request by an Israeli peace campaigner found that Barak’s Defense ministry has marked 10% of the West Bank for expansion of settlements over the years, including many settlements illegal under Israeli law which were later approved by the government (9). The Israeli group Peace Now also say more West Bank settler houses were constructed in 2010 (9 months of which were part of a moratorium on settlement construction meant to allow negotiations) than in 2009, before the moratorium (10). All this will boost the vote for Barak’s new party and even more so the joint election list announced by Netanyahu for his Likud party along with Leiberman , whose Yisrael Beitenu party won more seats than Labor in the 2009 elections and whose support base comes from immigrants to Israel from the former Soviet Union – mostly Russian, secular, but hardline Israeli nationalists (11). Israel’s ‘Law of return’ allows anyone with one Jewish grandparent or who has converted to Judaism as a religion the right to Israeli citizenship. In practice their partners are usually granted citizenship too, unless they are Palestinians or Arabs (12). The Israeli government is also forcibly relocating Bedouin Israeli-Arab Israeli citizens from the Negev region within Israel itself in order to make way for Jewish settlements within that part of Israel, who, like 19th century American Indians, have been forced to move twice already (once in the 1948 war and again in the 1950s) to make way for settlers (13) – (14). This is all part of trying to solve “the demographic problem” which is a euphemism for the Arab birth rate being higher than the Jewish birth rate within Israel and the occupied territories. The Israeli government wants to settle most of the West Bank without ending up with an Arab majority (15). The conflict between Israel and Hamas in Gaza serves to distract the US, the UN and international media from the West Bank and settlements. Palestinian President Mahmoud Abbas of Fatah ended negotiations with Netanyahu’s government in November 2010 because Netanyahu refused to continue a freeze on new settlement building in the West Bank, and returned to coalition with Hamas (the other half of the elected Palestinian government since the 2006 elections) from April 2011. (16). Whether any of these offers are genuine or not is debateable, but as many Israelis including former heads of Mossad and Shin Bet say there should be negotiations with Hamas without preconditions, because if even some of Hamas are serious about negotiations it will swing influence within the organisation in their favour if Israel actually makes any serious concessions (i.e full sovereignty for a Palestinian state in Gaza and the majority of the West Bank, including most of the water and farmland). If Hamas are not genuine Israel has it’s overwhelming military strength not to mention the world’s only remaining superpower the US as an ally, so it has nothing to lose by negotiating – except the majority of West Bank land and water which it wants to keep for itself. Israeli governments claim Hamas’ offers of negotiations on the basis of a ‘Hudna’ (an Islamic term from the Quran) for the 1967 borders are similarly just for an extended ceasefire and so worthless, though opinion among experts and even Hamas leaders on what a Hudna involves is divided.